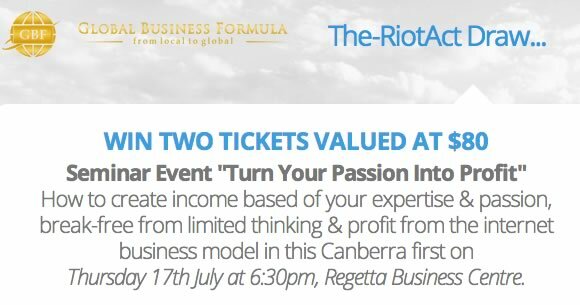 An exciting event for business owners, entrepreneur’s and anyone wanting to break-free from boredom, live a happier life and create extra income based on their expertise or passion. Do you want to create more income, enjoy more time off and make real change in the world? Do you believe that if you keep working the way you’re working you will achieve the goals or dreams you actually set out? Now is the time to get a refreshed attitude, learn how to set your own financial thermostat and what you need to do to capitalize on the Internet Business Model, so you can create your life by design not chance. There are also two bonuses for attendees. First you will create an income stream that night and secondly you will receive a HD Home Study version of the seminar valued at $197. Most of this information has been reserved for multi-million dollar and private coaching clients until now. On Thursday 17th July t 6:30pm you will learn some of the best tips and strategies to catapult your business into the next level. Win two free tickets to The Physics of Beer at Questacon!